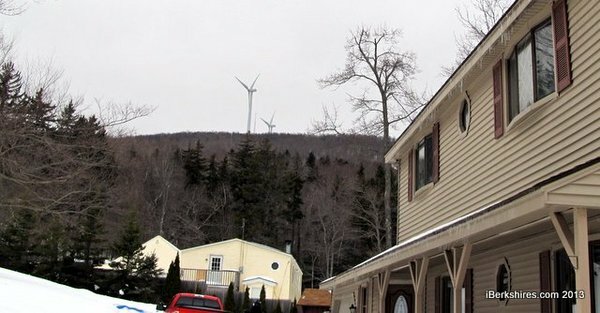 Residents in Florida, MA seem to be bearing the brunt of turbines in Monroe with the two-town Hoosac project impacting their quality of life. Berne says he is deaf, but still is affected by the sound. “It reverberates from Spruce Hill (behind the house) to the front of the house.” He said the windmill is about 2,000 feet from his home. He said his grandchildren, ages 11 and 12, have had trouble sleeping and have been bothered by the “pulsating” red aviation warning lights, an effect caused by the wind turbine blades passing in front of the red lights, intended to alert aircraft to the turbines’ presence. Berne pointed out that he “hasn’t seen a deer or moose” around his property since the turbines were turned on. “It’s just wrong to put (the turbines) this close to people,” he said. the wind turbines located near the Moores Road home of George Berne, created a sound resembling wind gusts from an approaching storm. The sound of rushing wind exceeded any visible wind that could be seen in the nearby trees. The MassDEP noise regulation limits maximum noise levels to less than 10 dB(A) above ambient. This regulation has been in effect since the 1970’s and is the result studies initiated by widespread noise complaints. This regulation has withstood the test of time and has been very effective in preventing widespread noise complaints for over 40 years. The widespread complaints against wind turbine noise can only mean one of two things. Either the regulation is misapplied, or the measurement protocol is defective when it comes to measuring maximum noise levels above ambient. The MassDEP response in Falmouth, Fairhaven, Kingston, and Scituate is unduly cumbersome and very long. In Falmouth it has been three years since the first complaints were filed, I Fairhaven we are coming up to a year with no conclusion, and in Kingston the MAssDEP is “passing the buck” to the MassCEC, the agency charged by Governor Patrick to install some 300 wind turbines in the near future. While in Falmouth the MassDEP found one of three identical wind turbines barely out of compliance only at night, private measurements show that it is grossly out of compliance at night and judging by the widespread daytime complaints a proper protocol would find them out of compliance in the daytime. The best indicator of noise violations is the widespread number of complaints.